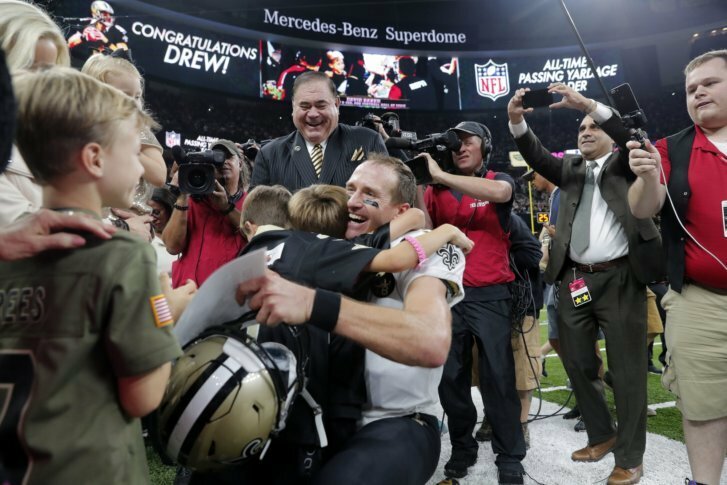 NEW ORLEANS (AP) — Before Drew Brees could blow kisses to the adoring Superdome crowd, before he could embrace his wife and children on the sideline, the Saints’ 39-year-old quarterback had to shred one of the NFL’s top pass defenses with ruthless efficiency. Brees passed Peyton Manning to become the NFL’s all-time leader in yards passing with a 62-yard touchdown to rookie Tre’Quan Smith on Monday night that sent New Orleans on its way to a lopsided 43-19 victory over the mistake-prone Washington Redskins. “It’s hard for me to reflect too much right now just because my career’s not done. There are still goals to be accomplished. There are still challenges to be met. And so I’m still very focused on that,” Brees said. “And yet, when something like this happens, there are so many people who are responsible for that, that are a part of that, that makes me happy. It makes me proud and it makes me extremely grateful — extremely grateful for the opportunity to play this game, to play it as long as I’ve played it, to have wound up here in New Orleans. Brees entered the game needing 201 yards to eclipse Peyton Manning’s previous mark of 71,940 yards. He had 250 yards and two touchdowns by halftime and finished 26 of 29 for 363 yards and three touchdowns. He has yet to throw an interception this season. He did, however, make his eighth career reception on his own deflected pass, and pushed across the line of scrimmage to add an extra yard to his career total. The Saints’ Smith, a third-round draft choice last spring, caught two touchdown passes from the 18th-year pro. Brees also hit Smith for a 35-yard score down the right sideline early in the third quarter. Any hope Washington had of coming back was all but snuffed out when Justin Hardee, a special teams regular who was in the game because of Marshon Lattimore’s concussion symptoms, snagged Alex Smith’s underthrown pass at the Saints’ 19-yard line and returned his first career interception to the Washington 4. That set up change-of-pace QB Taysom Hill’s 1-yard touchdown run that put the Saints (4-1) up 40-13. When Saints began one of their last first-half possessions on their own 38, Brees needed just 35 yards to break the record. On the first play of the drive, Brees launched a pass toward the right sideline to the speedy Smith, who was wide open and easily sprinted away from Nicholson’s tackle attempt en route to the end zone. Brees’ teammates ran toward their quarterback as he jogged behind the play, and a group of them formed a jumping, celebrating mass of black and gold next to the Saints’ fleur-de-lis emblem on the 50-yard line. Norman’s defensive holding penalty during Brees’ incomplete pass sustained the Saints’ first scoring drive, capped by Ingram’s short touchdown run. In the second quarter, Montae Nicholson’s unnecessary roughness penalty for leveling Ingram on Ryan Kerrigan’s third-down sack extended a drive that ended with Brees’ short TD pass to tight end Josh Hill.